La Trobe University is a large place and it's pretty easy to get lost on campus. Here is a guide to our commonly used performance and rehearsal spaces including information about the accessibility of each venue. If you have any accessibility requirements that aren't listed or any concerns, don’t hesitate to email us at student.theatre@ltu.edu.au, or call us at (03) 9479 1198. Located on Level 1, Menzies College DH Building. Menzies Theatre is accessible via a ramp with space available in the back row for wheelchair users. There is accessible parking available in front of Menzies College as well as in CP6. Located across the way from the Union Building. Nearest carpark - CP3 or CP4. The Moat Theatre is accessible via a ramp with space available in the front row for wheelchair users (gravel, somewhat uneven ground so caution advised). There is accessible parking available in front of the Union Building. Accessible, unisex bathrooms are available in the nearby building, on level 1 of the Union Building. Located on Level 3, Union Building. The Studio is unfortunately not accessible for wheelchair users as there are six steps leading into the venue. There is accessible parking available nearly at the front of the Union Building. Accessible, unisex bathrooms are available on level 1 of the Union Building. The Playroom is accessible via lift on level 1 of the Union Building. 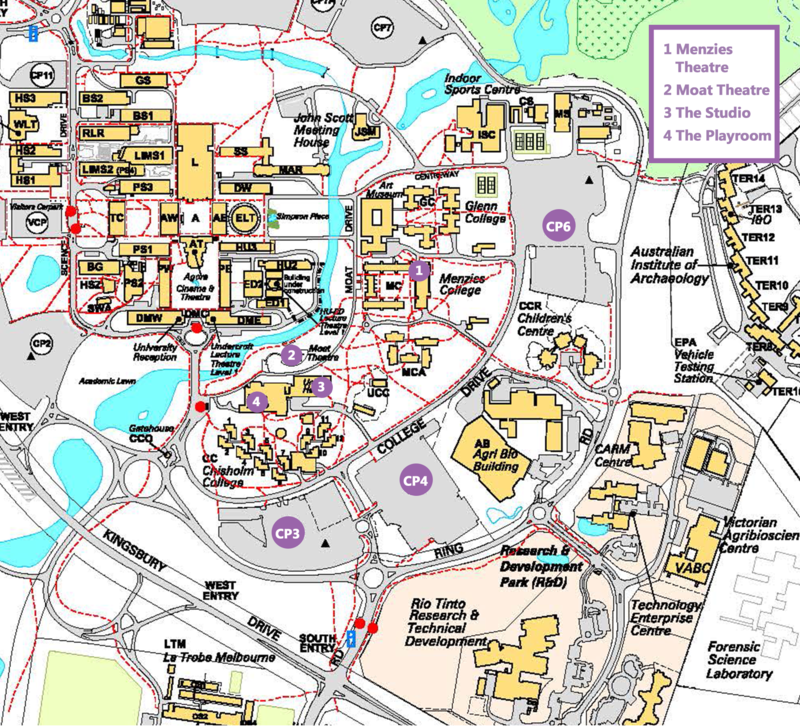 For physical accessibility maps, check out the La Trobe University website for more information.